Capall Dorcha Theatre Company is through to the Market Stall event on Saturday 24th of March at the Ardrossan Civic Centre 10.30am – 1 pm for the Three Towns Locality Participatory Budgeting Event. Sadly we found out on the 27th of March that we were unsuccessful in receiving enough votes to create the community choir from the local Paticipatory Budgeting Event. Capall Dorcha wishes to thank everyone who came along on the day to vote for us and meet with us to find out more about our services in the local area. Earlier in the year, Capall Dorcha Theatre Company created an online survey for just adults to reply, providing information on what creative opportunities that local people would like to take part in. Overall we had twelve different theatre art classes suggested, with the top five already planned for the area, from our play reading classes to local theatre nights, to local theatre productions. But the overall winner of the feedback was for a Community Choir. For a theatre company, it wasn’t that it was a weird request, as we started the organisation and continued to produce ‘A Night of Bradway’. We knew that this opportunity had to reflect the three towns and have a legacy attached to it. We know that it should be intergenerational, it should be accessible to all and most importantly space for you to share your love and expression of singing to others within the local community. And when thinking specifically of the three towns and of that legacy of someone who took it upon themselves to support others through music we couldn’t think of anyone else except Joan Gordon. Before Capall Dorcha was even an idea, it was Joan Gordon, a local lady from Saltcoats that helped our Executive Director Barry Robertson in giving him singing lessons. But you see it wasn’t just Barry that Joan had helped, Joan had been a local music teacher and directed the choir at St Cuthbert’s Church in Saltcoats for thirty-five years and was recognised in 2015 for this achievement. You see it wasn’t just teaching the choir, or playing the organ. Joan was one of the few in the area that allowed you to learn and improve your craft, provide an opportunity to sing in public or play the piano towards passing your exams with numerous students who would take part in ‘Sunday Anthems’ or annual Charity Concerts. 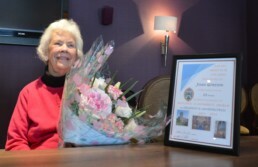 With her 80th birthday, the Ardrossan and Saltcoats Rotary club surprised Joan by making her a Paul Harris Fellow in honour of her contribution towards their charity and supporting their fundraising throughout the years. Earlier in the year, Capall Dorcha Theatre Company asked Joan’s daughter Suzy permission to use Joan’s name for our choir, and at the time we weren’t sure if the application would go to market day. But in our minds, we knew that if it goes ahead, Joan would be there ‘giving it laldy’ on the piano encouraging us all to take part and to sing louder. It is with this inspiration and talent that we couldn’t think of anyone better than to name our choir the Joan Gordan Community Choir. This week has been difficult for us at Capall Dorcha Theatre Company, as we received news that, we are through to market day for the Joan Gordan Community Choir. Though sadly on the 11th of March 2018, Joan, at the age of 87 years passed away, with the funeral later in the month. With our thoughts to Joan’s family and friends. On Saturday the 24th of March 2018 at 10.30pm – 1pm at the Ardrossan Civic Centre, Capall Dorcha will have a Market Stall meeting people throughout the three towns and sharing our idea of our intergenerational Community Choir, where the people of the three towns get to vote and decide what projects should receive funding within the local community. Please share your vote with us.